Lindsey Racing can take care of your fuel delivery needs whether you're just wanting to replace your factory fuel lines or want to upgrade everything from a new Lindsey Racing Fuel Rail to a new fuel pump and the lines in between. We also supply the best Fuel Injectors on the market for the 944/951. 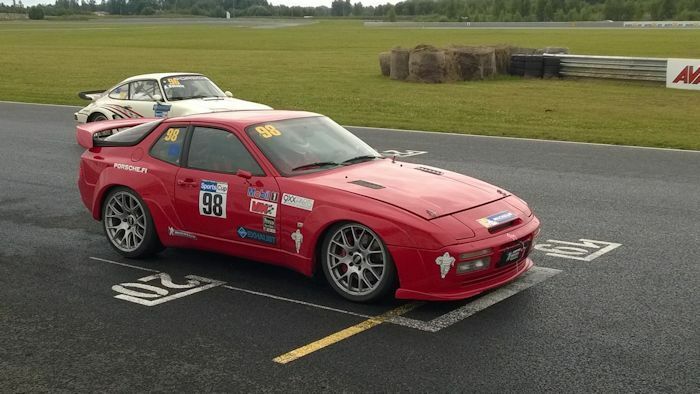 The Lindsey Racing Fuel Rail and fuel delivery components are available for your 944 Turbo and 944 NA '83 through '89. This is a professional grade fuel rail system which leaves nothing on the table. 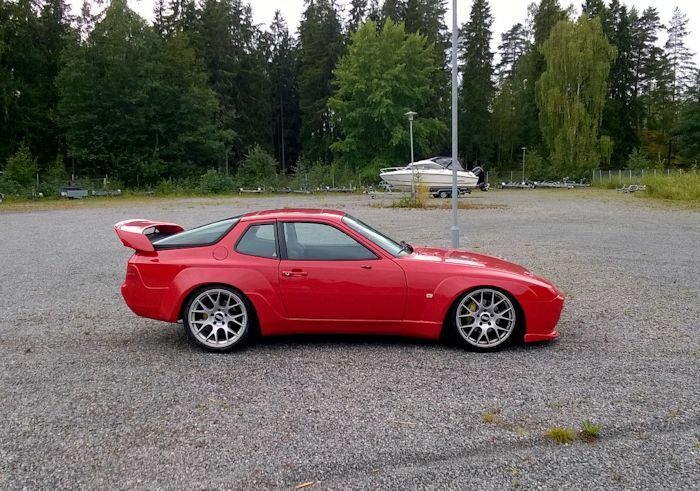 We have everything you need, depending on the development plan for your 944 or 944 Turbo. The Lindsey Racing Fuel Rail has a large fuel passage to flow enough fuel for any HP engine. It's CNC machined from extruded 6061 aluminum and anodized in Blue, Red, Black or Clear. It features 4 point Stainless Steel support arms and legs and a 3/8" NPT threaded Inlet and Outlet. Unlike the stock rail with it's poor design, this rail delivers the fuel in the front, exits it out the rear, and has the dampener where it should be, located on the end of the rail. This design insures equal fuel delivery to all four injectors. The Lindsey Racing fuel rail is set up to use the Marren Fuel Pressure Damper. Whenever multiple high-flow injectors are installed on a fuel rail, hydraulic pulsations from the injectors opening and closing cause the fuel to hammer back and forth. This creates pressure and flow variations within the rail and can lead to large inconsistencies in fuel delivery from cylinder to cylinder. A dampener is used to absorb these pressure fluctuations and allow each injector to receive the proper amount of fuel pressure and flow, eliminating rich or lean cylinders. This Fuel Pressure Dampener is designed with ultra-high performance, high capacity fuel systems in mind. It features a billet anodized aluminum body and a high-strength dampening membrane to eliminate any hydraulic pulsations in the fuel line. A Schrader valve is included to allow easy fuel pressure and sampling checks. Or remove the valve and it's threaded 1/8" NPT for attachment of your permanent fuel pressure gauge. This Billet Aluminum Fuel Rail system was designed to fit the 944 Turbo and the 944 8v 2.5L and 2.7L NA engines. We also have Fuel Rail Systems for the 16v 944S2 and 968 engines. This fuel rail like the factory rail, has 4 attaching points using Stainless Steel support legs and arms. 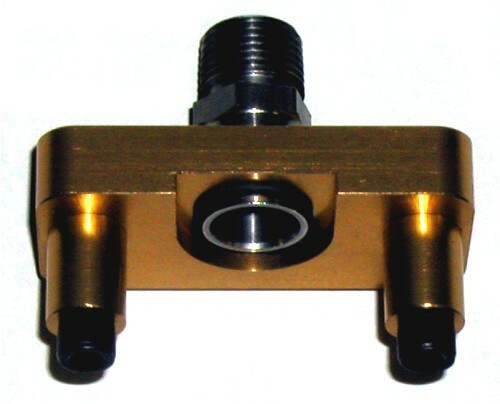 It has 3/8" NPT threaded holes located on the front and the rear of the rail for attaching fuel fittings and lines whether you wish to buy our complete kits or purchase our rail separately and do it your way. Like the LRA-944-FRAIL kit above, this kit includes the Marren Fuel Damper, "T" fitting between the damper and the rail that has a -6 male JIC connection (fuel outlet) and a -6 male fitting on the front of the rail (fuel inlet). This set-up takes you a little further then the previous kit. But still requires you to supply and plumb all the lines and bring in a fuel pressure regulator into the system. This 944 8v & 944T Lindsey Racing Billet Fuel Rail Kit was developed fur using a Remote mounted "adjustable" Fuel Pressure Regulator. It replaces the stock regulator and gives you fuel pressure adjustment for additional engine tuning. If you're not needing to comply with stock fuel regulator guide lines, then this may be the rail for you. We have two different fuel lines types or states of completion. A kit with the lines already cut and the fittings installed, and one with a length of hose and the fittings are not installed or what we call loose. Our "Assembled" fuel line kit works with our Lindsey Racing Fuel Rail. The lines are professionally pre-assembled, pressure tested, and all fitting selections and line lengths have been done for you. You literally just make the connections and bolt things down. It "does" require you to mount the fuel regulator in the position like you see in the above pictures on the firewall. The regulator being mounted on the firewall requires you to remove the cruise control unit. For those wanting something custom, we offer the fuel lines "Loose". The kit requires the end user to cut the lines and install the fittings. This will allow you to retain the cruise control, but you're on your own for routing the lines and mounting the Fuel Regulator. In addition to the 2 line types, we have 3 different line finishes. Varying fuel line type and finish on the fittings. All fuel line kits utilize compression fittings that allow you to properly tie into your factory steel feed and return lines. High quality EFI Adjustable Fuel Pressure Regulators are available in your choice of three different colors. Black, Red or Blue. These regulators are available with our fuel rail kits, or sold separately here. Loose Fittings and Line. You cut the line and install the fittings. This Lindsey Racing Billet Fuel Rail kit was developed to use a stock style fuel pressure regulator. You can also fit the popular adjustable fuel regulator (#4037) as well. The Regulator Adapter used in this kit was created to allow the use of a late style stock fuel pressure regulator on our Billet Fuel Rail and be legal for stock racing classes where you are required to run a stock fuel pressure regulator such as the 944 Cup Series or PCA stock classes. Even though this fits the '83-'89 8 valve 944s and 944 Turbos, on the early 944's, the fuel pressure regulator threads on to the rail and does not connect with a o-ring and two attaching bolts like the later 944's and 944 Turbo. So you will not be able to use your original threaded fuel regulator. You will need to get the o-ring type. If you're club racing and required to use a 2.5 bar regulator, then you simply get the later 2.5 bar fuel regulator and it's now legal. You're just now using the same regulator as the later 944's are. We also produced a special Fuel Line Kit just for this rail and adapter set-up. 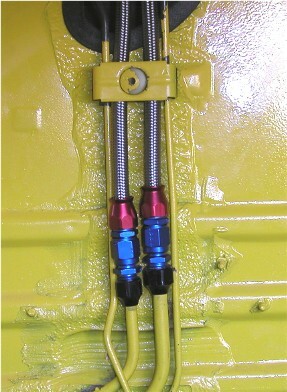 This line kit works for both cars where the steel fuel lines are coming through the right side shock tower, or up from behind the brake vacuum booster. This fuel line kit utilizes compression fittings that allow you to properly tie into your factory steel feed and return lines.